To statement or not to statement? That is the question. If you've read my blog before, you probably know that I have grappled with the idea of whether or not to indulge in the statement necklace trend. Ultimately, I resolved to do so, as I think it's a fun way to change up an outfit or reinvent pieces in your closet. My only stipulation is that I can't spend anymore than $30 on any one piece. With J. Crew's exorbitant prices it's often hard to keep in this price range, but it can be done though if you hit some of the J. Crew super sales right. For example, the J. 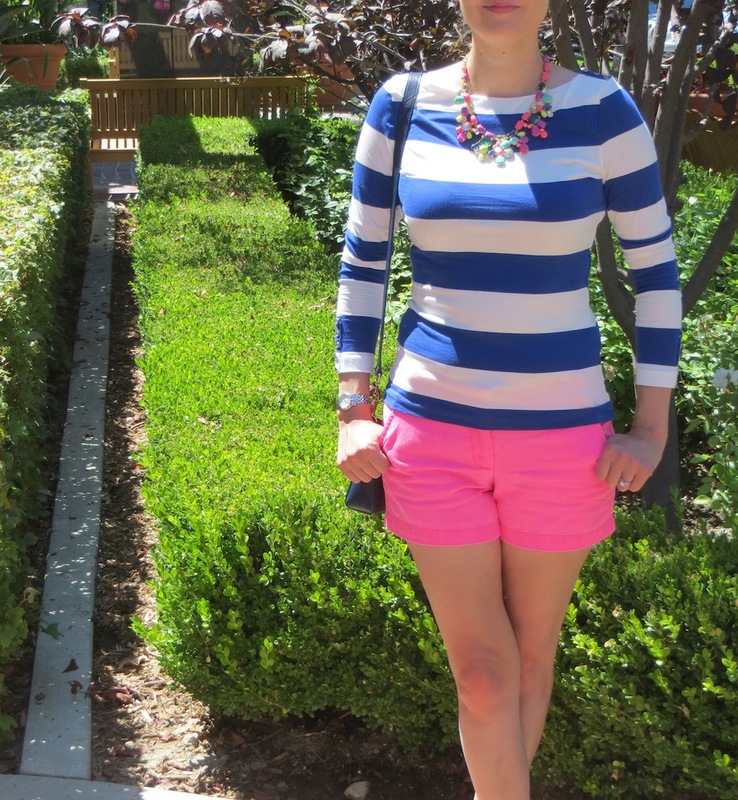 Crew color mix necklace which I am wearing below was $24.99, which is less than what some of the knockoffs go for. I was able to get it for this price by ordering it at my J. Crew store, getting it for the in store price (as opposed to the online price) plus 40% off and my educator discount. 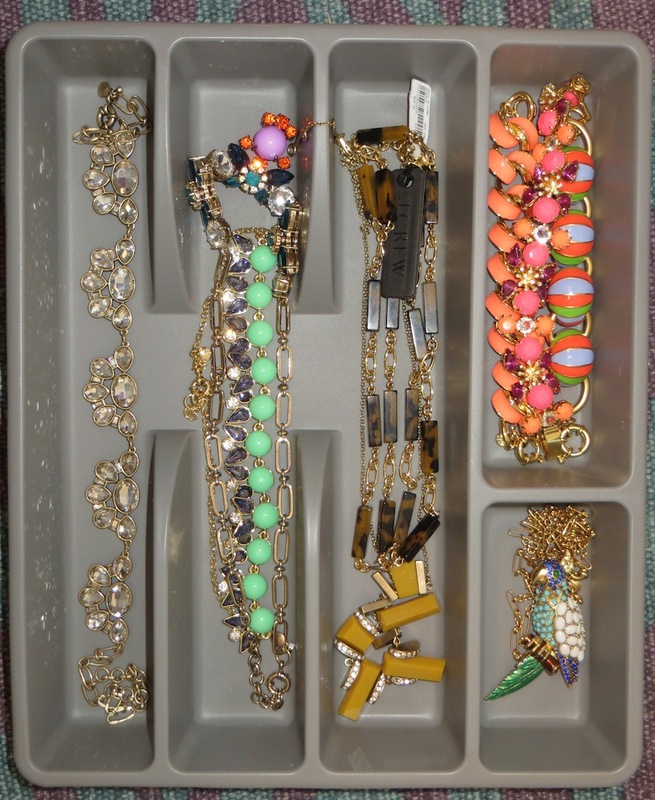 If you can't find the piece you are looking for at a steal, sites such as Groopdealz or Very Jane are great options. So when you amass a collection of statement jewelery, what do you do with it? I was throwing it into boxes, but then it was hard to see and also getting a bit tangled. That's when a light bulb went off in my head. A month ago my husband and I bought these trays for some of our flatware and cooking utensils for 99 cents each at IKEA. After we bought them we found some other trays that we liked better. My husband couldn't find the receipt to return these and we were only out $2 anyway, so these trays were just sitting around and collecting dust. That's when I realized that they would be the perfect way to store and organize my jewelery. Luckily everything fit perfectly as you will see below. The only exception were the slightly bigger pieces. I opted to store these individually in the boxes. Another storage idea is to use these collapsible kids' boxes for scarves, belts and other miscellaneous accessories. 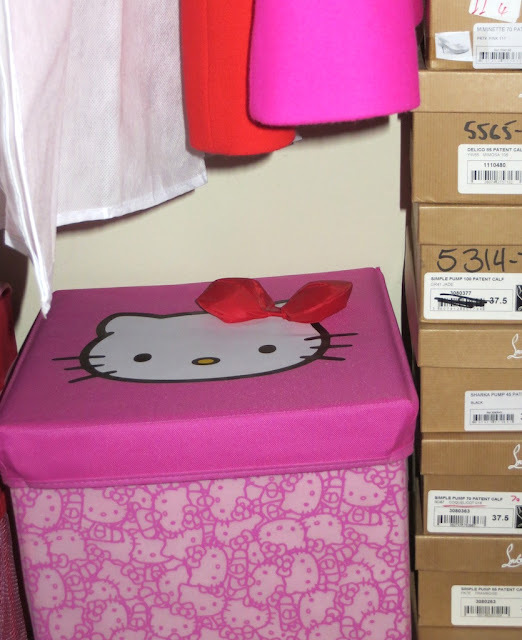 You can get "adult" ones I'm sure, but why would you want to when there are ones with Hello Kitty? Anyway, this is my famous box-o-belts. It is a color explosion of belts which go flying everywhere as I am trying to get dressed in the morning. Although I'm not a very organized person, I did try to get more organized with my time off over the summer. Do you have any handy storage solutions to share? Both these ideas are absolutely brilliant! I repurposed a long tie rack for belts in our old house but am stumped in our new house and will be heading back to IKEA shortly, so I will definitely implement the statement-necklace-as-flatware solution, and probably do a similar box as well. I'm glad that you can use the idea! It's a great space saver. I also love the tie rack idea for belts as it keeps them from getting tangled. 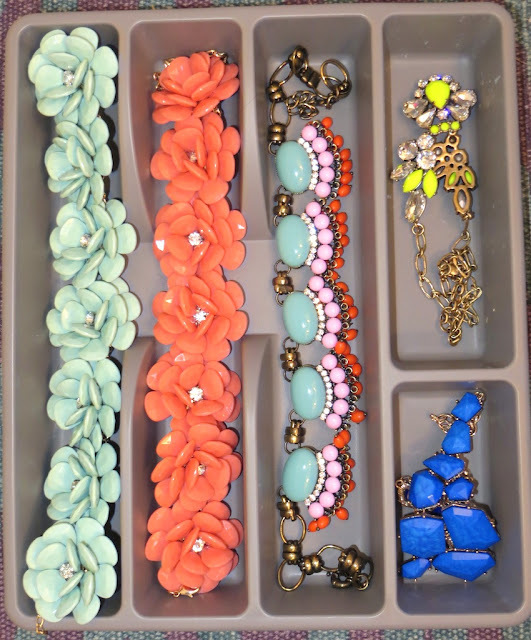 I love the idea of using hooks so you can admire your necklaces, but saving space is always a priority! You can also stack these on top of each other to save even more space.